LG Optimus 3D Max smartphone promises complete 3D platform | What Hi-Fi? LG has revealed details of its new Optimus 3D Max smartphone, which LG says will provide "a complete 3D entertainment platform". A sleeker design, more 3D content, upgraded 2D-to-3D conversion and TV streaming technology, and the inclusion of NFC wireless transmission technology are some of the key features. An upgrade to the existing LG Optimus 3D, the new Max supports the faster HSPA+ mobile network, which supports faster speeds than 3G. The Optimus 3D Max has a 4.3in 3D WVGA display with Corning Gorilla Glass 2, a 1.2GHz dual core processer, 8GB capacity and 5MP camera. While it will launch with Android 2.3, an upgrade to the latest 4.0 (Ice Cream Sandwich) OS is promised soon after launch. There's an HDMI output capable of supporting 2D, 3D (no glasses required) and 1080p HD content, plus standard features such as DLNA, WiFi, Bluetooth and GPS. 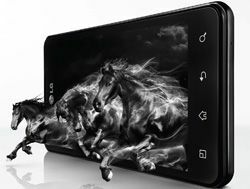 The LG Optimus 3D Max will be officially launched at Mobile World Congress in Barcelona, which opens this Sunday. We'll be there to get news on the latest smartphones, tablets and more.